The Employee Handbook is offered as a Download only. It is an electronic, MS Word Document, which can be downloaded immediately for viewing and/or printing. You will need MS Word in order to edit the handbook. After your order is placed, you will receive confirmation within moments. If your payment is approved, you will be re-directed to a download page from which you can immediately download this E-manual. Download times will vary, depending on your internet connection & other personal hardware issues. setting the stage for defending an employer from potential liability. Employee Handbooks can take considerable time to properly develop and implement. With this document, we have created a solid foundation for you. All that is required, is a little editing, on your part, to: put in the specifics of your own home care business operations; and, ensure the legal requirements, applicable to your area, are met. The document is written in MS Word and is designed to make editing fast, easy and user-friendly. 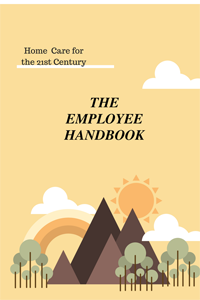 This Employee Handbook is a good companion for our Home Care for the 21st Century – Policies & Procedure Manual because it references the P & P Policy Numbers. This enables Management and staff to quickly look up more detailed information on the subject-at-hand. For those individuals, who do not have our Policies & Procedures Manual, we offer another version of the Employee Handbook. This other version does not reference our Policies and Procedures Manual but instead, refers to the various topics as stand-alones. If you have your own Policy and Procedure Manual, you can always insert your own numbers, if you choose but it is not required. The text part of the Employee Handbook is approximately 69 pages, but once you have selected the options you want, it will be a little bit smaller.